Before we look into what tech products are suitable for people living with dementia, let’s start by taking a look at what dementia is. Over the years, dementia has become a very common subject that is discussed in and out of the media. But what exactly is it? Dementia is neither a condition or a disease; instead; it is a collection of symptoms that affect a person’s cognitive ability leading to a declination in memory. It is estimated that there are about 47.5 million people in the world who suffer from dementia. One of the most common causes of dementia that accounts for about 60 to 80 percent of dementia cases is Alzheimer’s disease. When a person is suffering from Alzheimer’s disease, it means that their brain has scarce nerve connections and cells cause the brain size to shrink. Alzheimer’s is usually linked to protein abnormalities inside the brain. While Alzheimer’s disease is one of the most common causes of dementia, it is not the only cause. Other causes of the disease include mixed dementia, vascular dementia, dementia with Lewy bodies, Parkinson’s disease among others. And while dementia is very common among people who are above the age of 65, it appears the disease is becoming more apparent in younger people as well. It is estimated that more than 150,000 people are living with some case of dementia in the United Kingdom and more cases are still on the rise as people continue to age. Depending on an individual, the symptoms can develop slowly or quickly. Some of the symptoms include problems with recent memory, disorientation, difficulty in communicating, easily suspicious and irritable among others. While psychological effects differ from one patient to the other, the most common factors tend to be forgetfulness. This is true for both family members and people in general as well as the environment that one is in. It’s no doubt that people living with dementia can easily get lost in streets that were once familiar and forget family members that were once dear to them. And while people suffering from dementia have it rough, one of the most overlooked issues is the toil it takes on the loved ones such as family members, caregivers, friends and generally anyone that is around a dementia patient. While it’s not entirely impossible to cater to a dementia patient, it can be an exhausting undertaking if one isn’t well prepared to deal with the task. Seeing a close relative become suspicious of you or not even recognize you can take a toll on anyone. But having to deal with it every other day can be hard. However, all is not lost. Today, given that there is more research being done on dementia, scientists and doctors are looking into the cause and solutions regarding the disease. In addition, given the technological advances, dementia technology and gadgets for dementia is an area that has continued to witness sporadic innovations. 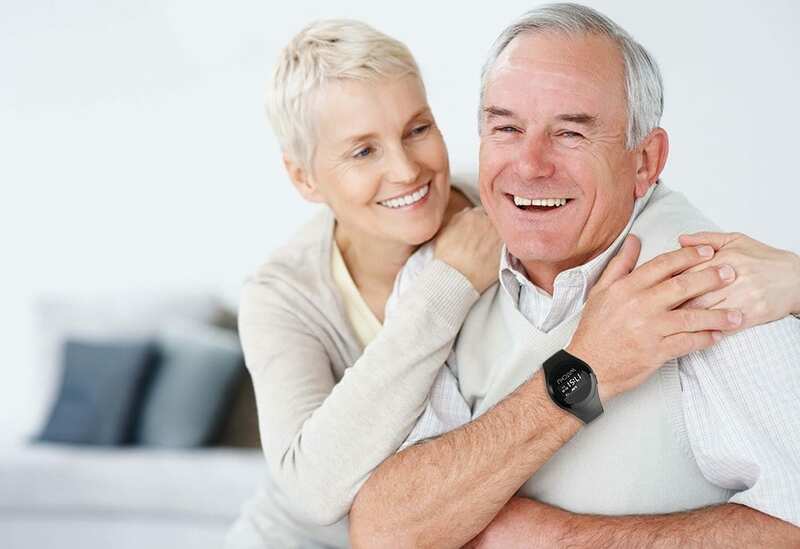 As a result, there are several tech products readily available in the market that can help ease both dementia patients and their caregivers better cope with the symptoms. Such devices range from clocks to GPS trackers among others. Below is a review of some of the best tech products for dementia sufferers. Although there are lots of digital clocks that are easy to read on the market, finding one that is specifically designed for people with dementia can go a long way in helping the lives of those living with the disease. 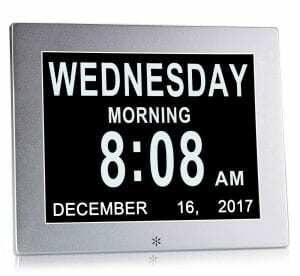 This digital calendar and clock is specifically designed for dementia patients and shows the exact time, date and day of the week. The best part about this clock is that there are no abbreviations used as abbreviations tend to be confusing for people suffering from memory loss. The high-resolution screen also makes it visible enough even in the dark, and it comes with no label for dementia or Alzheimer’s on the package so as not to cause any form of embarrassment. It has multiple display modes that you can choose for your settings. In addition, you can also use the clock to set a medication reminder which ensures that your loved one takes their medication on time every day. The 8-inch glare display comes in handy given that it enables the elderly to view it from anywhere. The clock also has a multilanguage feature which means you can set your preferred language. Another useful tech device that you can get for a dementia patient is a simple TV remote controller. Even for someone suffering from dementia, a TV is a good source of information, entertainment as well as companionship especially when they are alone. You can make it simple for your loved ones to continue getting information and entertained with this Big Button Remote Control. It not only has an ergonomic design, but it also works for cable box and TV which makes watching the TV and changing channels more intuitive and straightforward. The buttons are large and brightly colored. This makes it easy to identify which buttons are for what given that it only has an on/off button, a volume button, as well as channel and mute button. 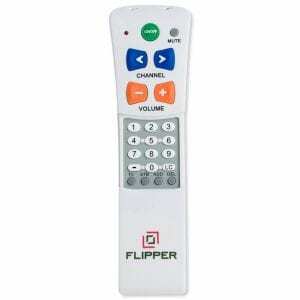 Using this remote, you can easily program 25-30 channels that offer the entertainment you desire. In addition, the remote has a special lock feature that helps prevent any form of channel reprogramming and is compatible with most infra-red TVs and Set Top Boxes. While smartphones have a lot more features, they aren’t designed to cater to the needs of people suffering from dementia. As mentioned, dementia patients need devices that are simple to use. If you are looking for a simple-to-use phone device, consider getting a picture phone. This phone is designed in such a way that it can be pre-programmed to call nine different people. 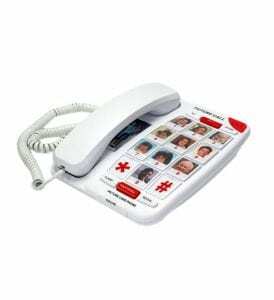 What makes it more fun is that you can stick a photo of the people you want under every button and when your loved one wants to make a phone call, they can do so by pressing the photo of the person they want to call instead of having to key in a ten-digit number. The phone has bright LED lights that light up whenever there is an incoming call. Alternatively, you can opt to label the phone using a hand-written note or sticker if it’s easier for your loved one to read. However, the phone should first be set up by a family member or caregiver as the set up might be a bit of a challenge for a dementia patient. The phone also has a 911 button that your loved one can dial in the case of an emergency or simply have it reprogrammed to a different number that can be called in case you are worried that your love done can dial it accidentally. Even with our brains functioning properly, once in a while we do need a reminder to get things done. This isn’t different from patients suffering from dementia even though they may need it more than normal people do. The Memo Minder Reminder Aid is a device that comes in handy for dementia patients. The device allows you to record a different type of messages for your loved one that are up to 20 seconds long. Whenever any motion is detected, the message is loudly played. These messages can also be deleted and re-recorded without the need for a memory card as many times as you would like. 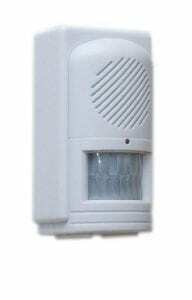 One of the ways that this device is most commonly used by caregivers is having a pre-recorded message that acts as a warning to a loved one not to get out of the house at night and have it placed by the front door. The device can be combined with a wall timer and power supply so that such messages are said within certain time frames. Not exactly a tech product, but this makes the list because of the hi-tech way this was designed. 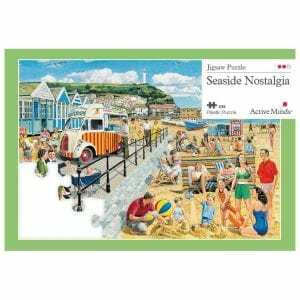 The 35-piece jigsaw puzzle is a product of Active Minds. The company won the National Dementia Care Awards for the category outstanding dementia product in 2015. This puzzle has been designed in collaboration with professional caregivers and dementia sufferers. It is a set of activities and games that are age appropriate for elderly people that are living with dementia. The puzzle comes with guide assistance that has prompt questions that help start conversations and can be used to assemble the pieces. The puzzle is designed to reduce the problems that come with dementia such as boredom, sadness, and isolation. In addition, it is also believed that these activities have helped boost the quality of life of people suffering from memory loss. The puzzle consists of large pieces that are organically shaped and can be built within the frame. This makes it easier for people suffering from their mid to last stage of memory loss to finish the puzzle with no assistance. The puzzle is designed to provoke conversations, memories, and stories. 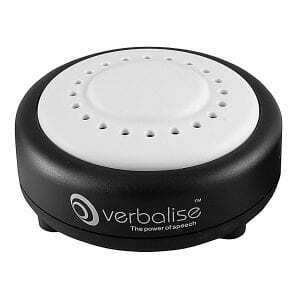 Another excellent device that can be used to remind dementia patients that it’s time to take their medication is this Verbalise radio-controlled medication reminder clock. This digital clock is circular in shape and has a digital clock at the base. It is designed in black and white colors to make it easy for dementia patients to notice it. By pressing the large button, the date and time will be spoken to your loved one in either a female or male voice. Given that the clock is radio controlled, it receives its signal from a radio transmitter that makes it possible to set the date and time as well as update them automatically in the event the clock changes. There won’t be a need to worry about constantly setting the clock and the only time you will need to do that manually is when the battery runs out. The clock can be set to receive the UK, USA, Germany and Japan time signals. This means that when your loved one travels to these countries, they won’t need to change the time as it’ll automatically update the time. However, if they visit other countries, they’ll need to set the time with the help of their caregivers manually. The clock can’t be easily knocked over and can record up to eight daily reminders. One of the most common side effects of dementia and Alzheimer’s is wandering. While your loved one might just set out for a simple walk, it’s easy for them to get lost given their forgetfulness. As such, having a GPS tracker watch can make a lot of difference and give you peace of mind. When a loved one wanders off, and you have no idea where they are, it can be very distressful for both the patient and family members. 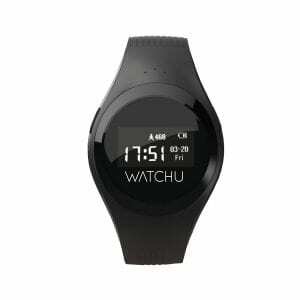 This GPS tracking watch allows you to easily find the wearer given the features that it comes packed with. The watch works straight out of the box and has a unique mobile network that enables it to switch between every major network to ensure that the watch has a maximum signal at all times. This is done so as to ensure you can always track your loved one in case they go wandering without anyone’s knowledge. Tracking can be done both indoors and outdoors and boasts a battery life of up to 120 hours. It has an SOS button that can be used in case of an emergency, an alarm, a voice messaging and a voice call. You can also programme the watch according to the specific geo zone you want. This way, in case the wearer leaves a given area, you can get notified. Taking care of a loved one who has dementia, Alzheimer’s or other similar conditions can be difficult for both the sufferer, family, and caregivers. However, it always doesn’t have to be complex, and all this is thanks to the continuous awareness and research being done in the field of dementia. While there is no current cure for dementia, tech products for dementia sufferers can help improve their quality of life. When looking to buy a tech device for a dementia patient, consider the symptoms that they exhibit as some of these products may not work for all patients. Technology devices for dementia patients play a huge role, and it can go a long way in slowing down the effects of dementia. Should I Buy a Mac or Windows Laptop for Work?